Anishinaabe artist Rebecca Belmore produced a piece called "Freeze: Stonechild Memorial" to commemorate the death of Neil Stonechild. This is Paul Kennedy in conversation with Belmore. Many turning points have marked the long and painful process called "Truth and Reconciliation." The death of Neil Stonechild is one of them. Stonechild, a 17-year-old Indigenous teen, was picked up by police in downtown Saskatoon in late November 1990, when the temperature was –28 C. He was later found frozen to death on the outskirts of Saskatoon. His death led to an RCMP investigation, and ultimately the firing of two police officers who last had contact with the boy. They were never criminally charged and maintain they did not have Stonechild in their cruiser that night. Anishinaabe artist Rebecca Belmore produced a piece called Freeze: Stonechild Memorial to commemorate the tragedy. 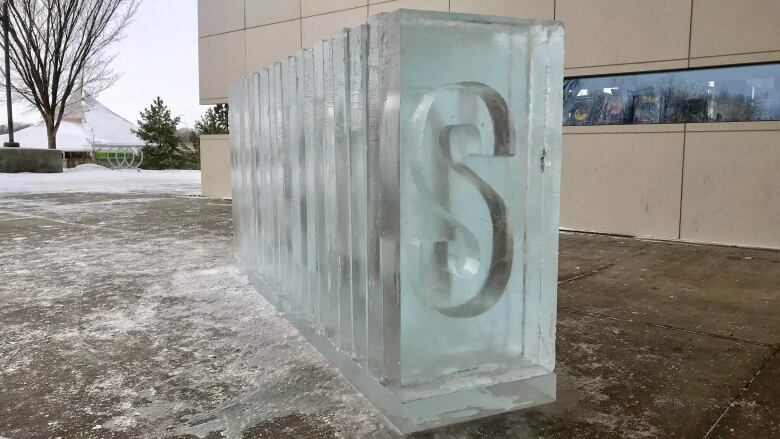 It's a sculpture made entirely of ice, and was installed outside the Remai Modern Gallery in Saskatoon since Feb. 1 when a major retrospective of her work called Facing the Monumental opened there. The work has since been removed after it was vandalized. Paul Kennedy and Rebecca are friends. Back in 2006, he made his way to a Toronto car wash, where Freeze made its first-ever public appearance, as part of the city's inaugural Nuit Blanche. He was also at the Remai Modern Gallery in Saskatoon, when it was re-created at the entrance to the building for the opening of the Belmore retrospective. In this episode, they engage in a friendly conversation about art, and politics, "Truth and Reconciliation" — all in a place, which one of the people in the documentary describes as "ground zero." Wanda Nanibush is Head Curator for Indigenous Art at the Art Gallery of Ontario, and exhibition curator for Facing the Monumental. Lyndon Linklater is Indigenous Advisor to the Remai Modern Art Gallery in Saskatoon. Ernie Walker is a professor in the Department of Archeology and Anthropology at the University of Saskatchewan. Leisha Grebinski is the CBC Radio Morning host in Saskatoon. Troy Cooper is Chief of the Saskatoon Police Service.